Hertfordshire churches tend to be damned with faint praise; guide books describing them along with the county as unexciting, unimaginative, unexceptional if not plain second rate or dull. Tourist guides and coffee table books on the county are rare, and when Hertfordshire is covered by more general publications, it is the same few churches that are mentioned, and none are placed in the first rank nationally. All in all, the ecclesiastical riches here have been poorly judged and remain mostly unknown outside their villages, an odd state of affairs when so close to London. The county’s main roads historically ran north and south, Hertfordshire was on the way to somewhere, not often a destination in its own right, and such is still pretty much the case today, with the M1 and M25 enabling motorists to cross the county without seeing any of it. An effort is required to reach the real Hertfordshire; you are unlikely to end up there by accident, and that means leaving the main roads behind, going out past commuter land, on to the B roads. Hertfordshire isn’t a big county, in fact it’s one of the smallest, but its position close to the capital has always attracted a dense population, historically along its roads, leaving the areas between relatively empty. Some of these roads are amongst the oldest in the country; Icknield Way carried travellers across the middle of the county before even the Romans arrived. Their roads were primarily military, with Watling, Akeman and Ermine Street fanning out from London to the rest of the country, built by the army for rapid deployment and constructed so well that they were not superseded for centuries. Apart from the Lea, few navigable rivers are to be found capable of carrying goods or passengers; two major canals were constructed running to the city, to the east the early seventeenth century New River, chiefly providing drinking water, whilst to the west ran the late eighteenth century Grand Junction Canal. The railway arrived in 1838, bringing commuters in its wake. This lack of easy transportation meant that the masons of our churches had to rely on local materials. Here that meant flint, an intractable material, though for detail the hard chalk called clunch could be imported from Totternhoe in nearby Bedfordshire, or if finances allowed, oolitic limestone from further afield. Occasionally, the concretion known as puddingstone appears; the Normans in particular seem to have looked upon this as semi-magical and in Hertfordshire nodules of it were believed to grow and multiply even as late as Victorian times. Clay was at hand, and the Romans made good use of it: their buildings were the source of the vast quantities of brick reused in the building of the abbey church at St. Albans. 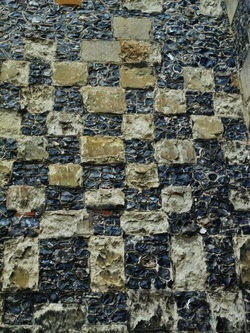 During the middle ages roof and floor tiles were made though few bricks until Tudor times, when it became fashionable to add details to churches in the “new” material. In Hertfordshire stair turrets and corbel tables were built, adding warm pinks and reds along the tops of cold grey flint walls. Multiple materials at St. Michael's church St. Albans; puddingstone , roman brick and flint. The best known churches are those close to other attractions: St. Albans has the cathedral of course, and many parish churches that are almost family shrines have become part of a visit to a house open to the public. Most houses built by the rich and powerful within reach of the capital had a church close by; St. Etheldreda beside Hatfield House, St. Mary in the park at Knebworth House, St. Peter near Benington Lordship, St. Lawrence within sight of Ayot House, All Saints near the Bury in St. Paul’s Walden, or Little Gaddesden’s Ss. Peter and Paul not far from Ashridge,. These churches often retain a Norman kernel with family chapels added to contain grand heraldic memorials to hereditary pride, whilst market town churches have more often been rebuilt in spreading Perpendicular by merchants and guilds, particularly those in the north east of the county such as Hitchin, Ashwell, Bishop’s Stortford, Baldock and Ware. The county town of Hertford was once amongst this group but has suffered badly, its main church being entirely rebuilt in an alien style in the twentieth century, which later ran a ring road between it and the town. On a more positive note, coaching roads string churches like pearls, providing the need for inns and money for churches alike. Some of the best churches are those lost in the countryside, like Anstey or Little Munden, or hiding in forgotten pockets surprisingly near London in villages such as Aldenham, Watton at Stone and North Mymms. Even within Greater London itself, churches clutch parkland around themselves and retain a rural environment like some temporal microclimate, as at Monken Hadley, or at East Barnet, where an outcrop of the past sticks up through the surrounding tide of urbanity as it has for close to a thousand years. Hertfordshire’s churches punch well above this small county’s weight, particularly in range of style and perfection of detail, and for somewhere so close to the capital this is a forgotten and unexplored area: I hope to give you grounds to rectify this and these churches more reasons to stay open.